(Feb. 22, 2018) Central City in Motion is Portland’s plan for strategic investments to accommodate a rapidly growing population living and working in downtown and the Central Eastside and a Sounding Board group is helping guide the process. The project, which will build on existing long-range plans and identify next generation investments, includes numerous infrastructure improvements including: safer intersections, separated bikeways, transit priority treatments, and clear demarcation of street space for freight, transit, and bicycles. Sounding Board members review the project selection process flowchart and network maps, which will be used to develop a prioritized list of multimodal transportation investments in the central city. Photo by Gabriel Graff, Portland Bureau of Transportation. The Sounding Board is meeting five times from late-2017 to mid-2018, in addition to providing one-on-one strategic advice to the project team. 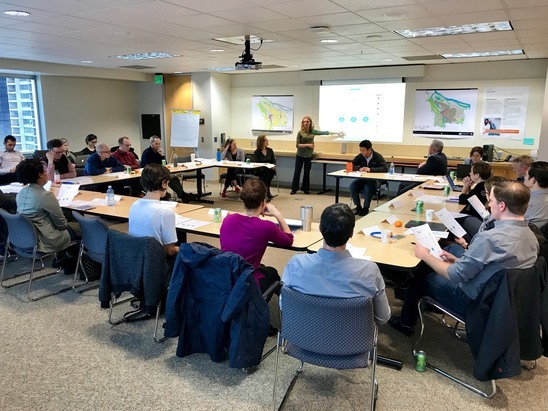 On January 18, 2018, the Sounding Board members convened for the second time and provided feedback on streets under consideration for transit priority, low-stress bikeway and pedestrian safety improvements. The discussion has helped inform the project team’s approach as we prepare for an interactive online open house, which will go live at the end of the month. Click here sign up for Central City in Motion updates, including the launch of our online open house.